I don't know about you but I am a huge fan of the Polish Pickup. Where else can you find the opportunity to buy from so many brands in one place? Brands that are old favorites and new brands at the same time. One of the New Brands for me is JReine back in April for the Across the Universe theme with a polish called the Galaxy Rocks. For me, this is a very complex color. It looks grey, purple or blue depending on the lighting and angle. 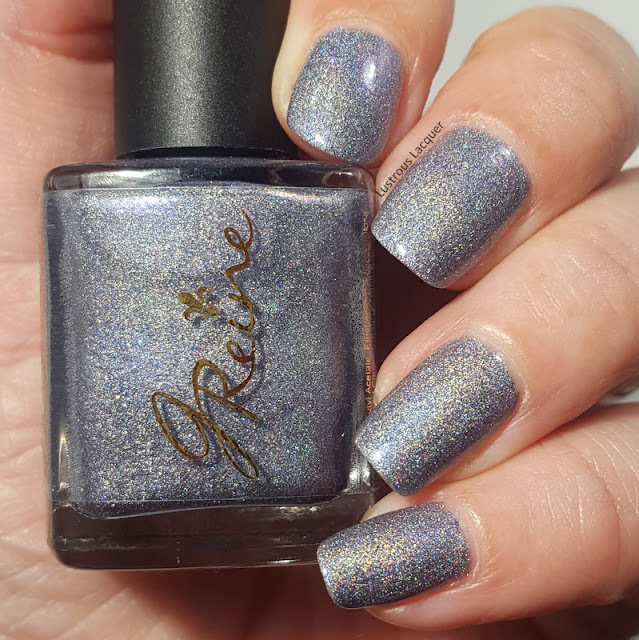 It's the reason purchased this polish, I was mesmerised at the first swatch photo and had to have it. Sadly my photos don't seem to do this polish any justice. 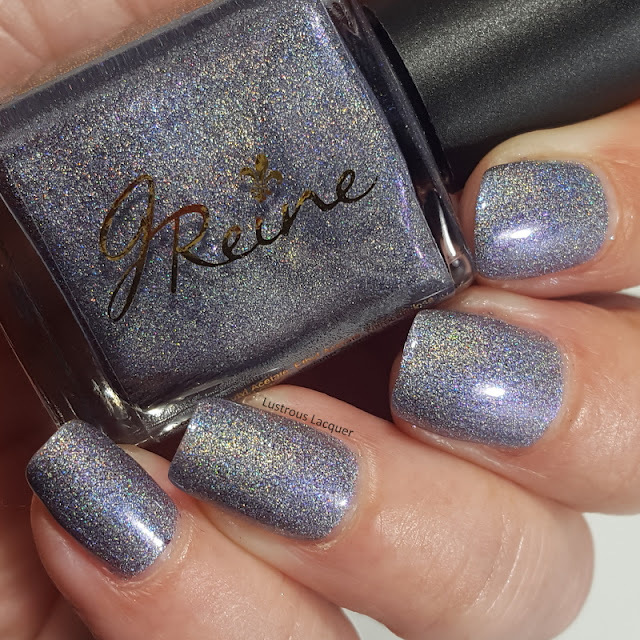 JReine describes it as a strong duo holo base with two multichrome pigments loaded with blue and pink microflakies and copper, pink, violet and turquoise glass flecks. 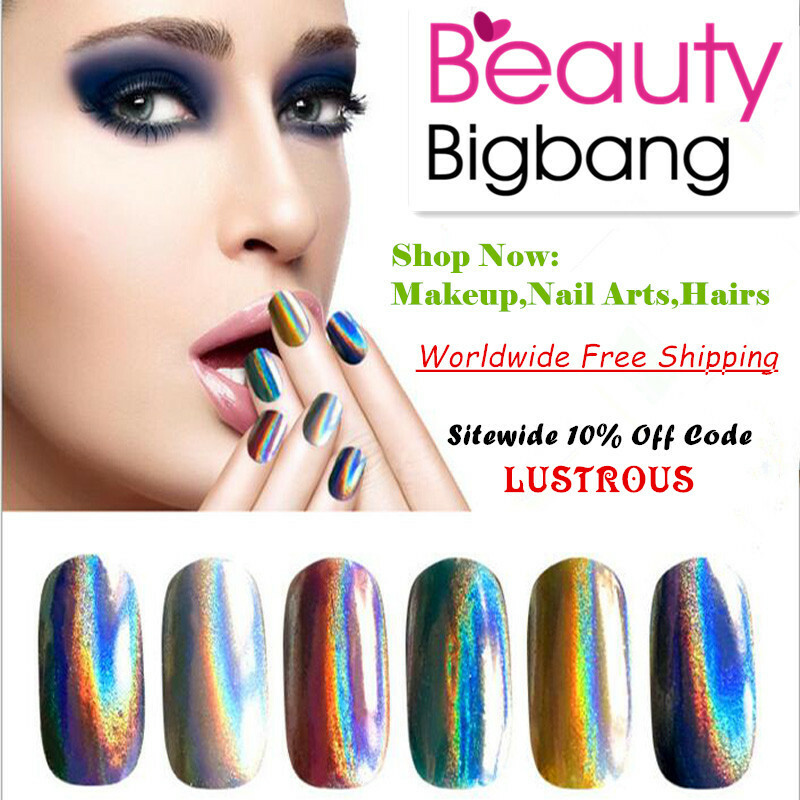 I don't know about you but this is the first time I've heard of a duo holo polish. Or at the very least heard of a polish being described that way. I'm not sure if that means it has scattered and linear holo or two different sizes of holo pigments. If you know the answer would you let me know in the comments, please? The formula on this is as perfect as the color. It flows effortlessly from the brush to the nail for even streak-free coverage. The Galaxy Rocks has a high opacity on the first coat with no VNL and dries to a glossy finish. I'd call it a one coater but the color on my nails was lighter than what I saw in the bottle after only one coat. Shown here is two perfect coats plus top coat. For my first experience with JReine, I have to say I'm very impressed and feel that this is a brand to watch. From the gorgeous color to the smooth as butter formula and the effortless application I can say with certainty that I will be purchasing from this brand again. What is your favorite purchase from Polish Pickup? 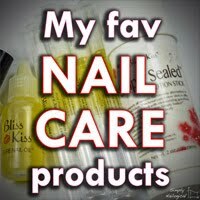 Have you discovered any new to you brands, or never made a Polish Pickup purchase? Let me know in the comments and as always thanks for stopping by and Happy Polishing!